Be the first to share your favorite memory, photo or story of Queen. This memorial page is dedicated for family, friends and future generations to celebrate the life of their loved one. Queen Esther Sanders-Phillip entered this world on October 30, 1934 in Darlington County, South Carolina to the late Eddie King and Esther Johnson King. She was educated in Florence, South Carolina and attended Woodrow Wilson High School in Florence, South Carolina. Queen Esther is truly a Queen. Many friends knew her as “Queenie,” but close friends and family called her “Dolly.” Her nickname Dolly indicated that you were in the presence of someone who quietly demanded attention and respect. She had beautiful skin, never requiring make-up, but always wearing lipstick. She married the late Joseph Sanders prior to migrating north where she settled in Harlem, New York, Newark, New Jersey, and lastly Linden, New Jersey. She married the late Leon Phillip on May 17, 1997. While in Newark, she was a member of Canaan Baptist Church until she moved to Linden where she joined Greater Mt. Moriah Baptist Church. She was an active Missionary. Queenie much like her mother, Esther retired from two jobs, Regal Press Printing and Senior Services. Queenie was a very busy woman, even with seven children. She could sew, put up wall paper, paint, play board games, travel with and without kids, make costumes, and redecorate her home at a minimum twice a year. Queenie sold Princess House Crystal and Copperware. She was a member of the ELK’s Lodge in Newark and served as an Eastern Star, where she served as Worthy Matron of her chapter for more than 20 years. She and her two cousins started the Antrum Bacote King (ABK) Family reunion that is still held every Memorial Day Weekend for the last 39 years. She never missed one. She attended this year’s reunion in Connecticut. Her children called her Mommy, when we attempted to call her by her name the response was “I got your Dolly”. The staff at Trinitas Hospital knew her as, Miss Queen, who lived at 47 East Morris Avenue, right next to the school. However, she was most known for her hospitality and cooking. Queenie’s home was an un-official boarding home to family and friends going through trying situations. If you were moving up north you stayed with us for about six weeks, until you got a job and your own place. If you were displaced, you stayed with us, you attended school and needed a place until your semester was completed. If you were her children’s friends who needed a meal or a good night’s rest, you stayed and ate with us. She always made room. Her children were never hungry, smelly or dirty unless by choice. Queenie’s most requested dishes were biscuits that melted in your mouth, collard greens, cabbage, rutabagas, French toast, roasted chuck steak and liver. Queenie had one brother, Eddie King, Jr. aka “Sonny,” who preceded her in death. Queenie leaves to cherish precious memories, her seven children: Joseph Sanders (Deborah) of Newark, NJ, Audrey Nazulme of Philadelphia, PA, Pedals Adams of Linden, NJ, Karen McCall (Vaughn) of Dover, Del, Glenda Belle of Sayreville, NJ, Wanda Belle of Jackson, NJ and Brian Sanders of Plainfield, NJ; two step-children: Alfred Lovelace and Lavonne Phillip; seventeen grandchildren, thirty great-grandchildren, one great-great-grandson, five first cousins, and a host of nieces, nephews, cousins and friends. She is loved by many and will be missed. To send flowers or a remembrance gift to the family of Queen Esther Sanders-Phillip, please visit our Tribute Store. 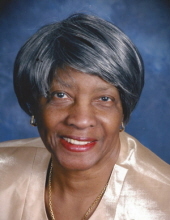 "Email Address" would like to share the life celebration of Queen Esther Sanders-Phillip. Click on the "link" to go to share a favorite memory or leave a condolence message for the family.